Are you seeing an increase in your church's "outreach temperature"? will give you the awareness and skills you need to share your faith with the people in your everyday relational circles. Workbook available separately. A prayer guide to unleash what you have been longing for.. in your life, in your church, in your city, in your nation! Are you often unsure of how to pray beyond �Lord, save them?� An intentional scripture-based prayer guide and journal for lost friends and family. Includes simple and effective ways your church or small group can demonstrate the love of God to those in your community. Includes practical and creative ways for you and your church to reach out to people with physical, emotional, and relational needs - in your community. This modern paraphrase brings John�s message of transforming hope and life in today�s language. Includes a Gospel appeal. Simply written and illlustrated, this booklet takes the inquiring person through the steps to accepting eternal life in Christ Jesus. Reg. Price $63.00 Limit of one toolbox per church. 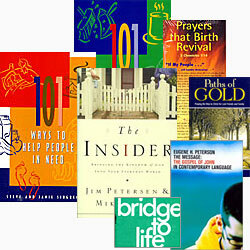 Order any of these titles separately at a 20% discount.